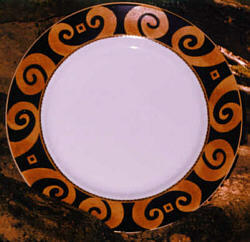 This went through a number of kiln fires to achieve it's fine design. Brush strokes were intentionally left in the hand painted, soft pink border to give it an artistic quality. Fine line artwork, enameling, and 24 karat gold complete this exquisite piece. 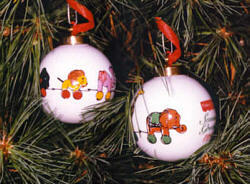 For years it has been the tradition of Fisher Price Inc. to offer their employees commemorative Christmas ornaments. 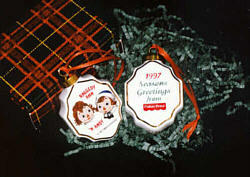 In 1996, when NCM Studio began producing their ornaments, we started a new tradition: Featuring that year's commemorative toy on the ornament. "NCM Studio has exhibited the highest degree of professionalism and quality standards of workmanship in our dealings with them. The studio not only provides their services on a timely basis but their input has been invaluable in creating works of art that are lasting and unique. We recommend NCM Studio for your next project." We have an ongoing relationship of producing a variety of custom projects for J.E. Caldwell's corporate division. Many of these designs include hours of historical research. 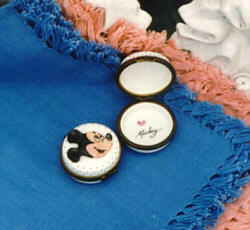 When designing some special projects for Disney, we went from a very small ring box to a jumbo 72 oz. teapot. Mickey's head on the ring box is 3D. 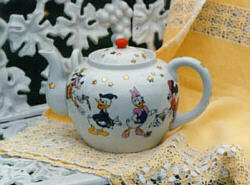 The teapot was designed to be a limited edition hand painted collectible. 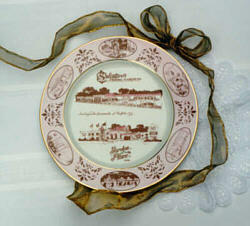 This service plate was designed in coordination with the redesigning of the main dining room. The swirls on the plate echo shapes found in the both the wrought iron work on the walls, and the carpet chosen, completing a totally coordinated look. Since 1994 the Studio has supplied the BYC's premier regatta. These trophies have been very well received by their racing participants. Your personal attention to designing a different theme for our trophies year after year while working within out budget has been outstanding. But most important you have met all of our deadlines which obviously is always a concern when hosting a major regatta. 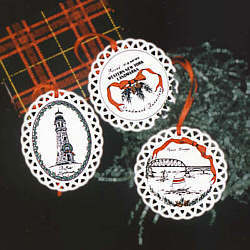 A series of Western NY Christmas ornaments were produced as a marketing campaign for Landmark Furniture Co. Sold exclusively through their store, a new ornament is released each year. 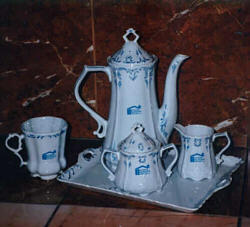 This coffee set is used to serve business associates and clientele in the conference rooms of each of Power Funding's branches throughout New York State. A gift boxed mug matching this set is given to each customer as a thank you. Unhappy with the existing design, I was given the task of redesigning Christini's service plate to more closely match the logo on their business cards. Although my design was never purchased, I felt it was a spectacular design which warranted being shown! 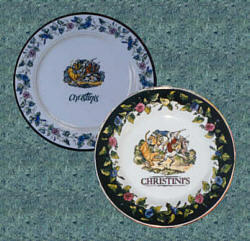 Pictured is the original plate at upper left, my design lower right and Christini's logo below.